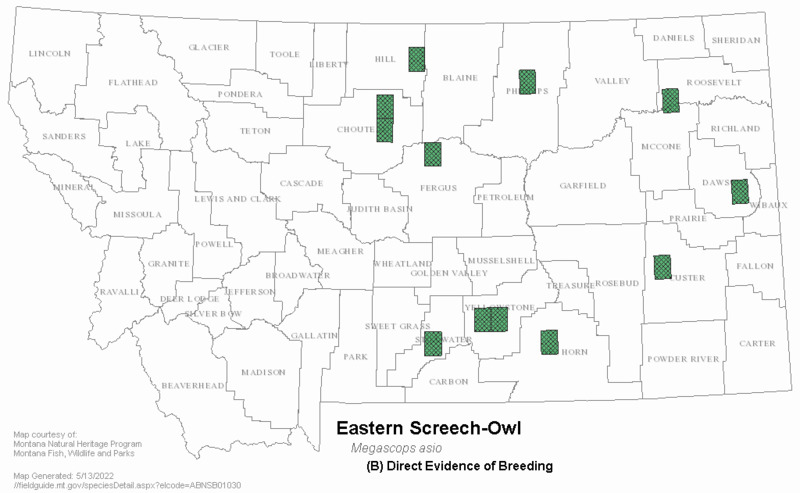 In the Eastern Screech-Owl, tufts are present, the eyes are yellow, the bill yellow-green or yellow-white. The facial disk is gray-white surrounded by black fringe. Ventrally, they are pale brown to whitish with scattered dark brown streaks extending from the chest along the sides and flanks. Dorsally, they are buffy-gray throughout. Also, Eastern Screech-Owls inhabiting deciduous forests of the eastern United States have a rufous (rust) color phase. A specimen of this color phase has yet to be secured in Montana. The size is eight to 10 inches. The weight is six to seven ounces. The voice has two parts. The first part is a quavering, drawn out ascending whistle, "Wheeeee" similar to a horse's whinny. The second part is a vibrating low whistle, "Quohohoho" run together. Calls are short. The Western Screech-Owl is similar in size, although slightly larger. 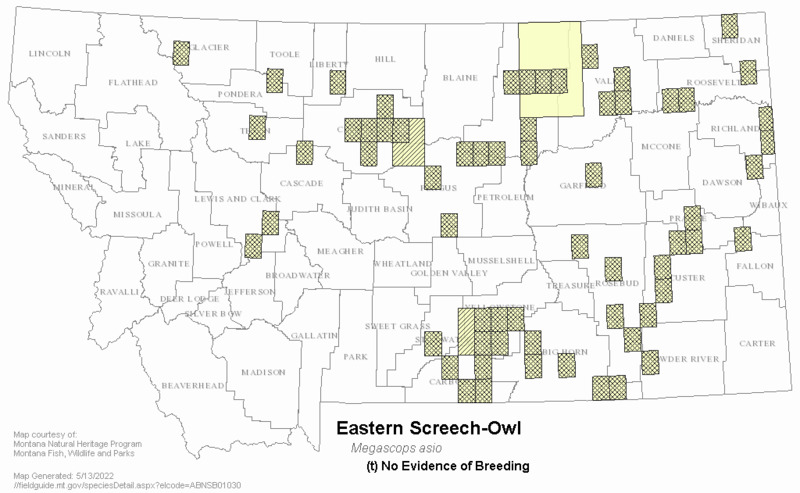 The Western Screech-Owl bill is black to gray-green or gray-black and the overall plumage is gray. 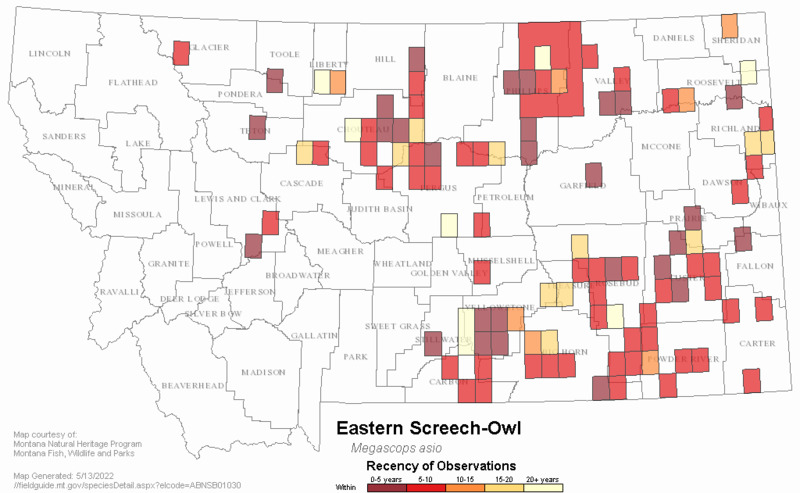 Eastern Screech-owls are resident throughout the year. Habitat is primarily cottonwood bottoms. Primarily small mammals and a few birds. Usually defends a permanent polyterritory (=2 nest-roost cavities and adjacent space) (Gehlbach 1995). Begins nesting in March. Nests in natural cavities or woodpecker holes. Clutch size three to seven. Incubation approximately 26 days. Young fledge at approximately 30 days. Young birds out of nest in July. 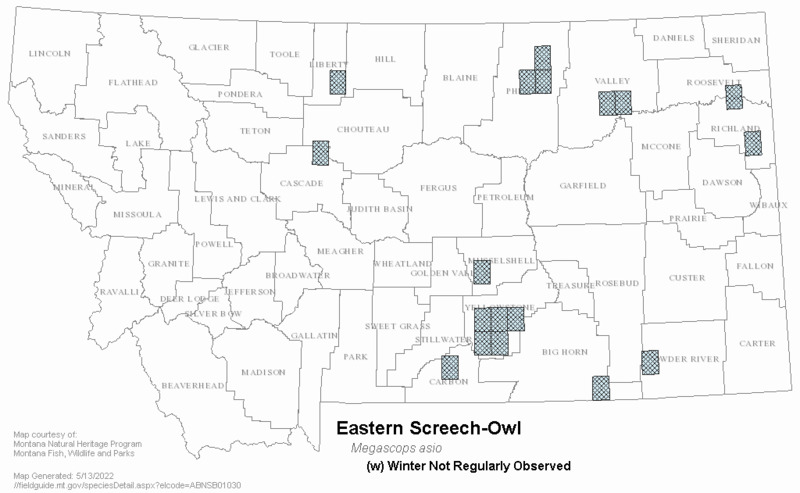 Egg dates probably similar to those reported for WY (April) and Colorado (April 7 to May 6). Main requirement is a suitable cavity tree or substitute like a nest box (Gehlbach 1995). Adam, C. I. G. 1987. 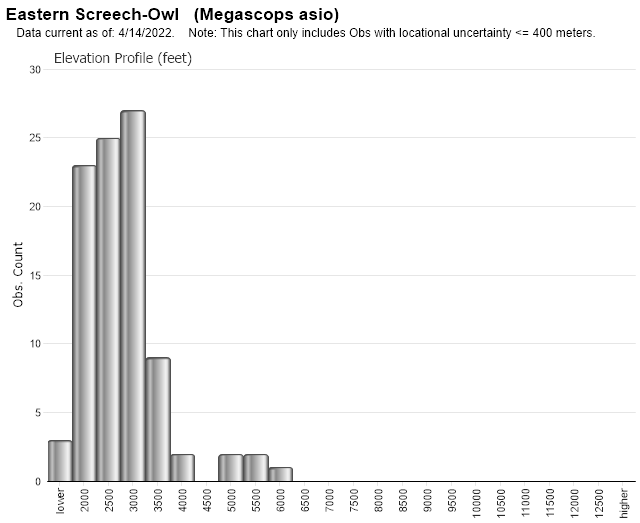 Status of the eastern screech owl in Saskatchewan with reference to adjacent areas. Pages 268-276 in: B87NER01. Rogers, Ralph R. 1998. 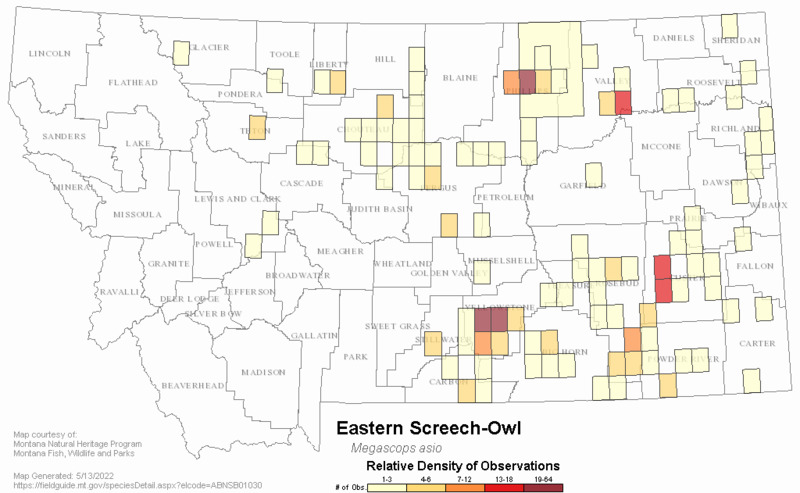 A Survey of Forest-Dwelling Owls in the Judith Resource Area of Central Montana. A Report for the USDI BLM Judith Resource Area. 10 pp + tables. 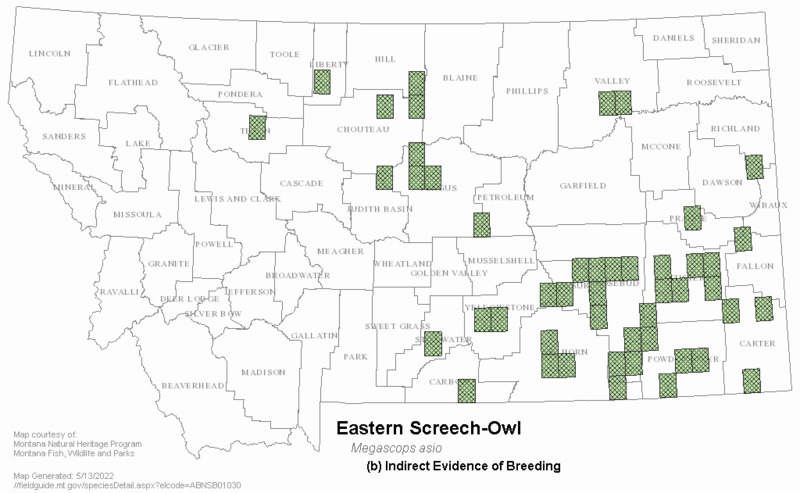 Web Search Engines for Articles on "Eastern Screech-Owl"